The last few years I’ve made our Christmas cards on a website and inserted pictures. This year, we didn’t get any professional photos taken and I decided to go a different route: DIY. I bought pre-cut cards from Michaels, the kind that are even pre-creased and all you have to do is fold them. They even come with envelopes. (I used the Recollections brand.) Mine were 4″x5.5″. I strongly recommend folding them on the crease, then using fingernails to make a crisp fold. This way, they fit in the envelopes better. I had some stationary paper in two shades of green. It was easy to make a tree – fold part of the paper in half and cut a triangle. Unfold to find a bigger, symmetrical triangle. I traced several triangles first. I cut them out next. I glued the small one down first so the big triangle tree would appear in front. Next, I added the star stickers. You know, those sheets of multicolored shiny stars? I used red for the big tree and either silver or gold for the smaller tree. Used a thin gray Crayola marker to add “Merry Christmas” in my best cursive. 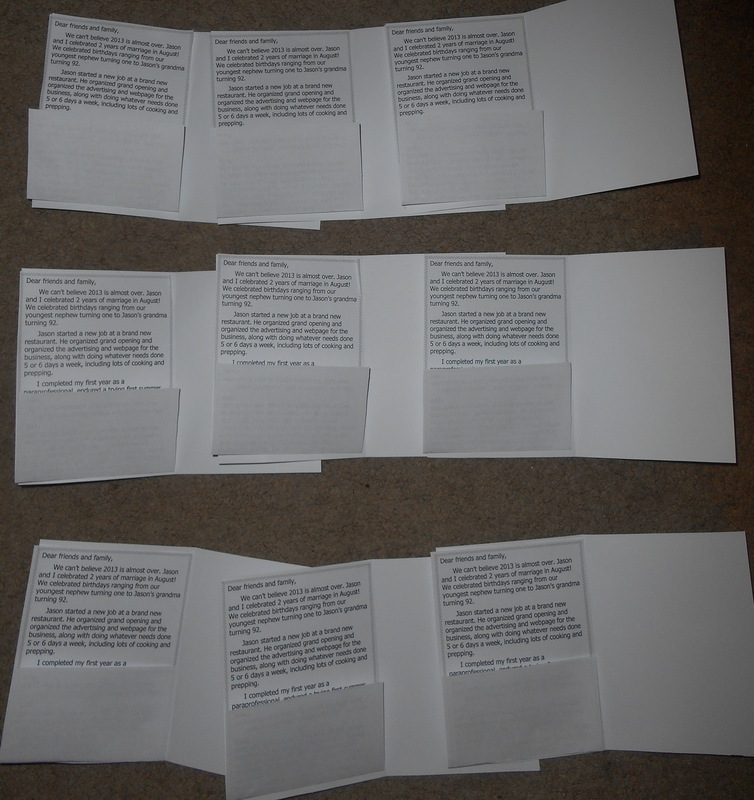 For the inside, I wrote a brief, generic letter in a word processor for each sendee. It was the width of one side of the card, and a little longer than the length of the card. I found the line I wanted to fold the paper up on so it would fit and folded them all, so I’d know where to apply the glue stick, before gluing any. In the fold of the letter I put in the selected two photos I printed a while ago. I made a picture collage of two vertically oriented photos and printed them on 4×6 photo paper through Walmart’s photo website. When I received the prints, I cut each one apart using my portable paper cutter, so they are 3″ x 4″. On the opposite inside, I wrote a much more brief personalized message in green pen and signed it for myself, and had Husband sign for himself and for our dog, who appears in one of the pictures. 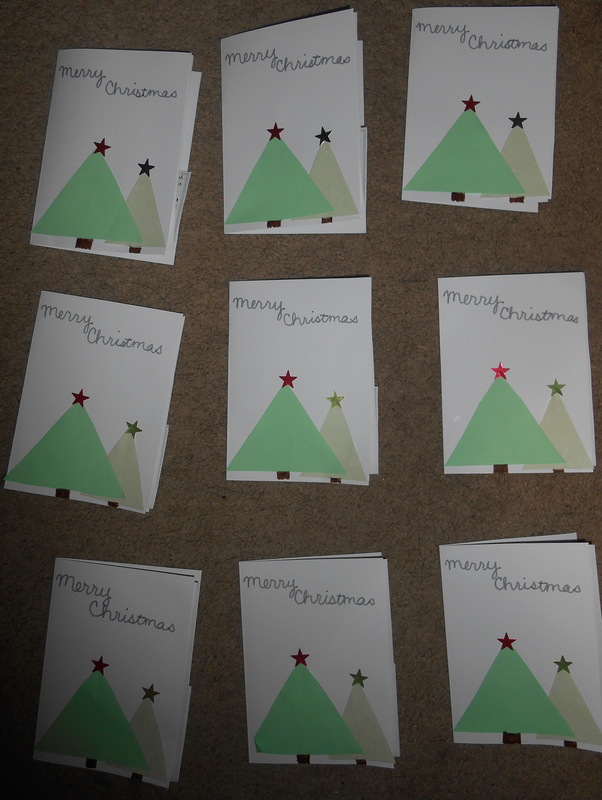 The trick to making 30 nearly-identical cards is to do each step on each card before moving on to the next step. 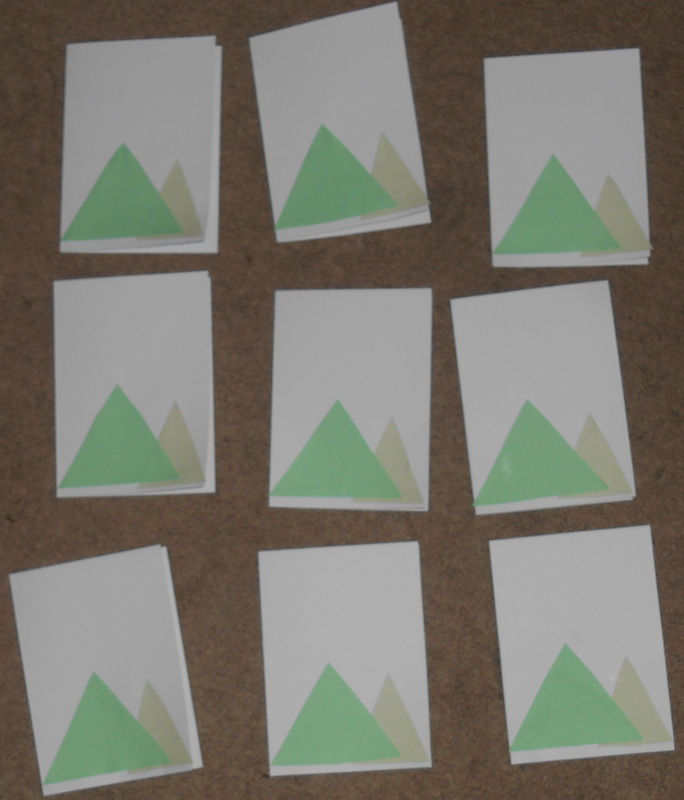 For example, I creased ALL the cards, then traced ALL the big triangles (that would fit on a folded page)… etc. It was easy to do all that when the big and small triangles were all cut out. 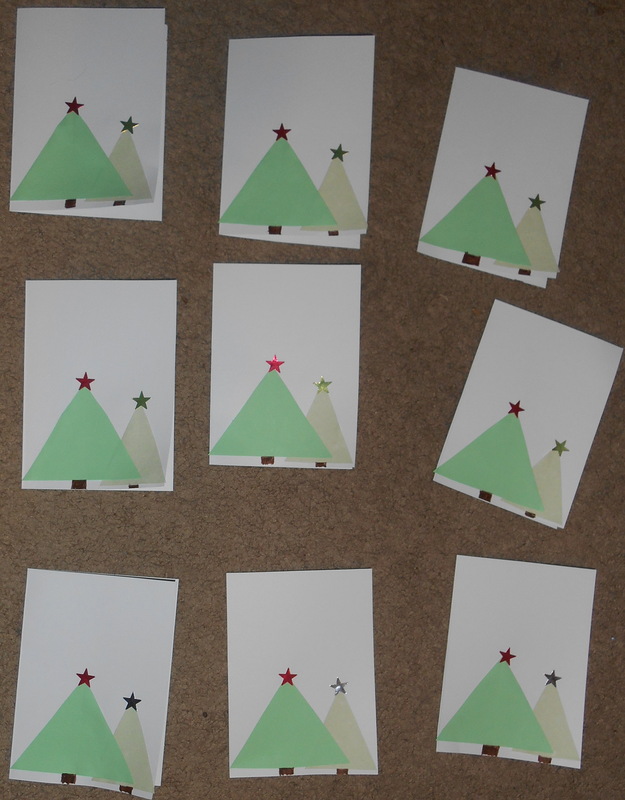 I glued all the triangles, THEN stuck on all the stars, THEN drew all the trunks, THEN wrote “Merry Christmas” on each card…. It flew by, and I think made them look closer to identical. An even easier holiday notecard for those friends who don’t need the whole letter: HERE! 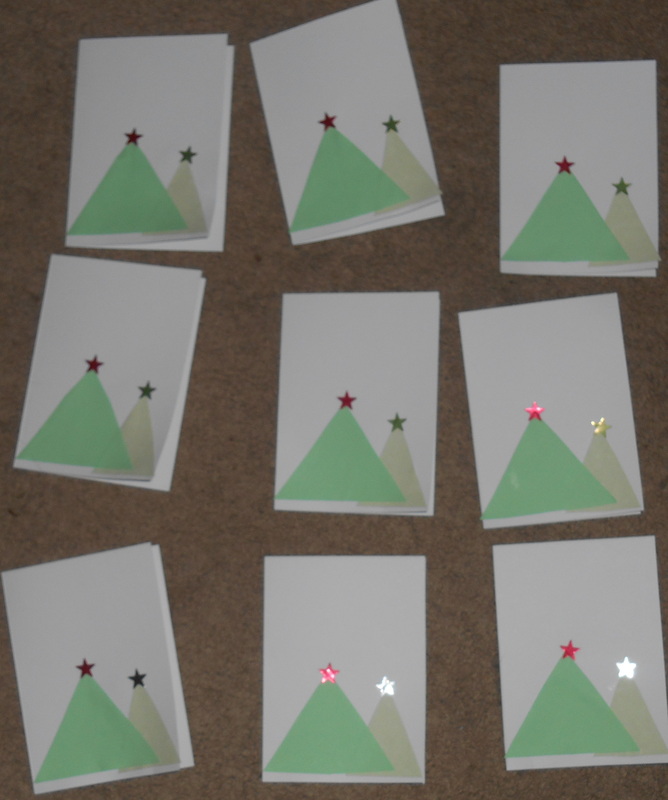 This entry was posted in Cards, DIY, How-To and tagged card, christmas card, DIY, do it yourself, easy, holiday card, mass production, step by step. Bookmark the permalink.